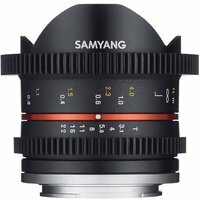 This 8mm manual focus, wide-angle fisheye cine lens from Samyang is designed for digital cameras with an APS-C image sensor. The focus gear ring allows for a follow focus system and with distance scales marked on both sides and an uncoupled aperture gear ring the aperture can be precisely and quietly adjusted to ensure a smooth, jump-free transition for professional looking video. The T number (T3.8-T22) represents the actual light transmission and at T3.8 you are able to capture natural, atmospheric footage under various lighting conditions. Fisheye lenses are great for special effects use where distortion and exaggerated perspectives are desired.